Energy savings and a quiet home was the result of this whole house window replacement project. 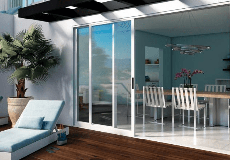 Ultra Series Fiberglass French patio doors offer quality, low maintenance, and the security of a 5 point locking system. A Ranch Style home becomes Mid Century Modern with Bronze Aluminum windows. A unique tear down project shines with Essence Series.